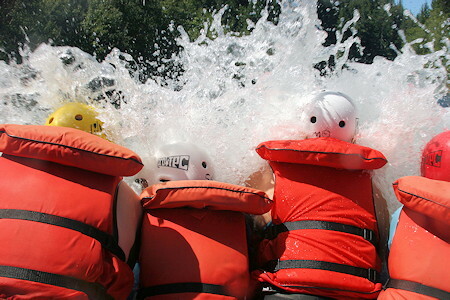 River Rafting, Campbell River, Vancouver Island, BC. Destiny River Adventures Whitewater River Rafting Company on Vancouver Island. 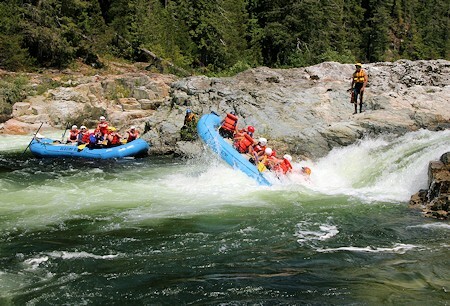 River Rafting Wilderness Adventures on Vancouver Island! Destiny River Adventures Rafting Company, Campbell River, BC. 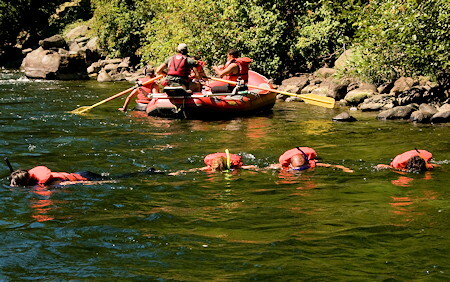 Welcome to Destiny River Adventures and our diverse selection of amazing river rafting adventures. We are a rafting company that offers a variety of tour experiences including serene scenic floats, snorkeling with the salmon, family river adventures, thrilling whitewater and multi-day river expeditions! Our trips focus on the whole river adventure - wilderness, wildlife and personal discovery are key to the exploration of our rivers and making your memories unforgettable. With almost 60% of our guests coming back for more, we know that you will enjoy your trip with us. Our licensed professional guides provide a safe and friendly atmosphere and allow us to offer trips suitable for almost everyone. 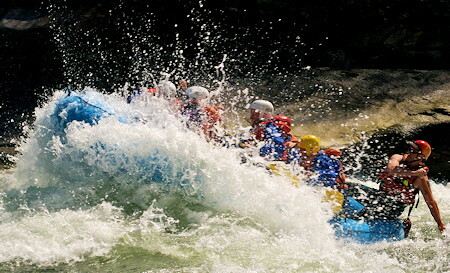 River Rafting Adventures on Vancouver Island! Rafting & Snorkeling with the Salmon - join us on this unique trip on the heritage designated Campbell River from late July to late October. 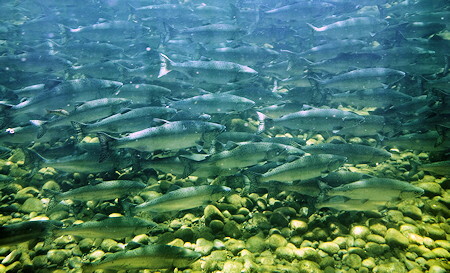 Jump in and go snorkeling with the thousands of returning salmon or stay dry and view from the raft. 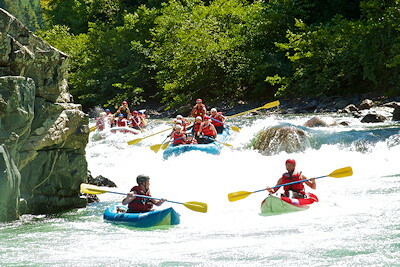 Choose from two full day river rafting trips from early May to August. The Nimpkish River Adventure is suitable for families and groups, while the Nimpkish Whitewater tour is for adults and older teens. Novice rafters may choose a 3 hour tour on the Campbell River or Oyster River as a great way to get your feet wet in this fun sport almost any time of the year! Wilderness lovers enjoy the multi-day expedition on the Southgate River in the Valley of Falls. 4 days and 3 nights on the river, helicopter and boat tours included to access this river. An easy scenic wilderness river trip complete with glaciers, waterfalls, grizzly bears, and fishing. Or try the three day Nimpkish Adventure as your introduction to multi-day river tours. Limited to groups of 4 to 10, May to July for the Nimpkish tour, August and September for the Southgate tour. 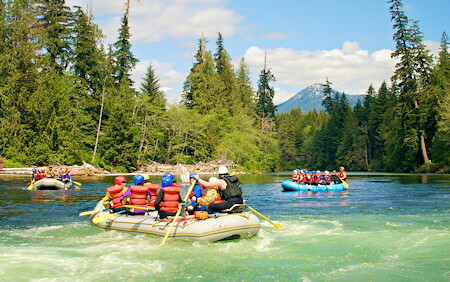 Destiny River Adventures is a river rafting compnay based in Campbell River, British Columbia, Canada on the east coast of Vancouver Island. They are approximately 1.5 hours north of the Nanaimo ferry terminal or 3 hours north of Victoria. They also have two customized buses available for charter for your own event when Destiny River Adventures is not running rafting tours and throughout the winter months for charters on Vancouver Island or to anywhere within BC.